← Another birthday card I just HAD to share! 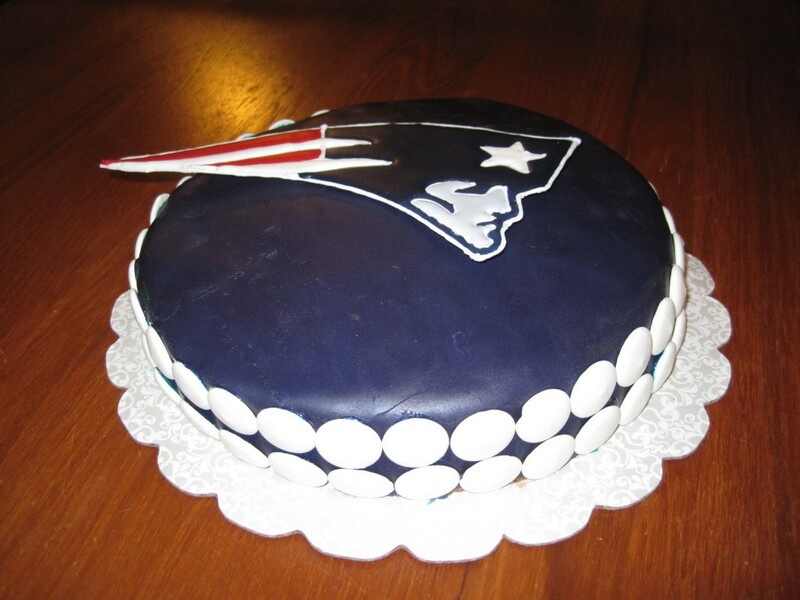 The AFC and NFC championship games took place the weekend of my birthday, and I got my birthday wish… the Patriots are playing against the Giants in the Superbowl!! I’m a Boston-born girl living in New York, so this should be really interesting. 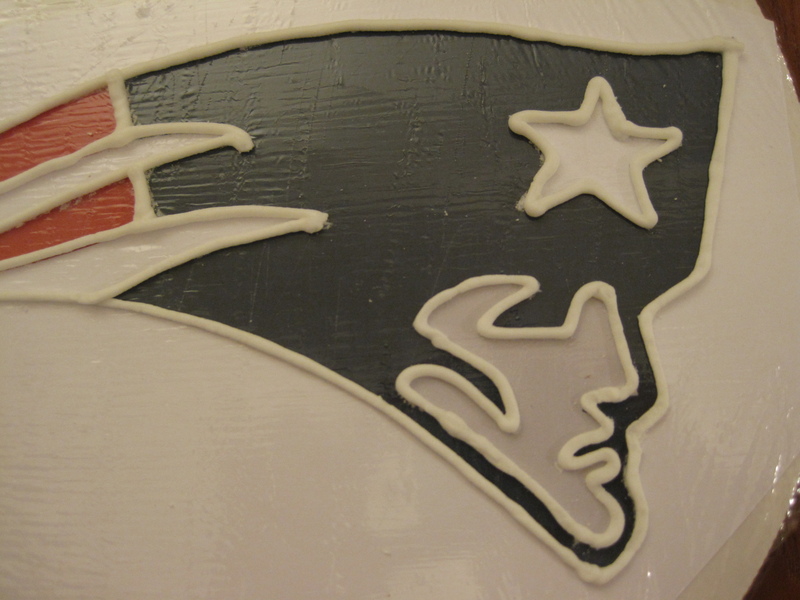 I knew I had to make a Patriots-themed cake for the party I’m attending. 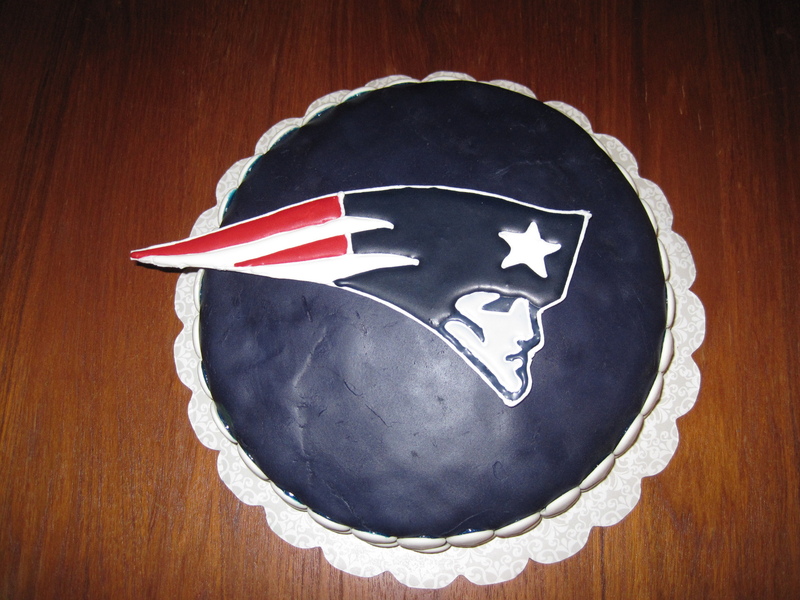 And better yet, I knew the inside of the cake HAD to be Boston Cream Pie! This cake may look simple, but it was a big job. It involves nearly everything that I know how to make: cake, custard, buttercream frosting (chocolate to be exact), marshmallow fondant, color flow, and royal icing. I’ll go through making the cake first, and then how I decorated it. Meanwhile, whisk the egg yolks in a medium bowl until thoroughly combined. Whisk in the remaining 2 tablespoons sugar and whisk until the sugar has begun to dissolve and the mixture is creamy, about 15 seconds. Whisk in the cornstarch until combined and the mixture is pale yellow and thick, about 30 seconds. When the half-and-half mixture reaches a full simmer, gradually whisk the simmering half-and-half into the yolk mixture to temper. Return the mixture to the saucepan, scraping the bowl with a rubber spatula; return to a simmer over medium heat, whisking constantly, until a few bubbles burst on the surface and the mixture is thickened and glossy, about 30 seconds. Off the heat, whisk in the butter and vanilla. Strain the pastry cream through a fine-mesh sieve set over a medium bowl. If you don't have a sieve, just make sure the lumps are dissolved while it simmers on the stove top. Extra mixing with a rubber spatula helps with this. Press plastic wrap directly on the bowl to prevent a skin from forming and refrigerate until cold and set, at least 3 hours or up to 2 days. Preheat oven to 350 degrees. Fully cover two 8-inch or 9-inch pans with Wilton Cake Release using a silicon brush. Make sure to get in the crevices where the bottom and sides of the pan meet. Whisk together the flours, baking powder and salt in a medium bowl. Heat the milk and butter in a small saucepan over low heat until the butter melts. Remove from the heat and add the vanilla; cover and keep warm. Separate 3 of the eggs, place the whites in the bowl of a standing mixer, reserving the 3 yolks plus the remaining 2 whole eggs in another bowl. Beat the 3 whites at low speed until foamy. Increase the mixer speed to medium and gradually add 6 tablespoons of the sugar; continue to beat the whites to soft, moist peaks. (Do not over beat.) Transfer the egg whites to a large bowl and add the whole-egg mixture to the mixer bowl. Beat the whole-egg mixture with the remaining 6 tablespoons sugar. Beat at medium-high speed until the eggs are very thick and a pale yellow color, about 5 minutes. Add the beaten eggs to the whites. Sprinkle the flour mixture over the beaten eggs and whites; fold very gently with a large rubber spatula. Keep adding the mixture gradually and fold in until it is all incorporated. Make a well in one side of the batter and pour the milk mixture into the bowl. Continue folding until the batter shows no trace of flour and the whites and whole eggs are evenly mixed. In the event that there are still lumps, you can fish them out with a fork after you pour the batter into the pans. I found it was hard to get all the lumps out when folding the batter. Soon after taking the cakes out of the oven, gently run a knife around the pan perimeters to loosen the cakes. Turn each cake onto a cake round or plate. Refrigerate for several hours before assembling the cake (which works out perfectly since the custard needs to set for several hours as well). Bring the cream and corn syrup to a full simmer over medium heat in a medium saucepan. Remove from the heat and add the chocolate; cover and let stand for 8 minutes. (If the chocolate has not completely melted, return the saucepan to low heat; stir constantly until melted.) Add the vanilla; stir very gently until the mixture is smooth. Place one cake on a cake round. Spoon the custard on top, making sure not to reach the very edges, or it may leak out the sides. Add the second cake on top, making sure the two layers are in line. 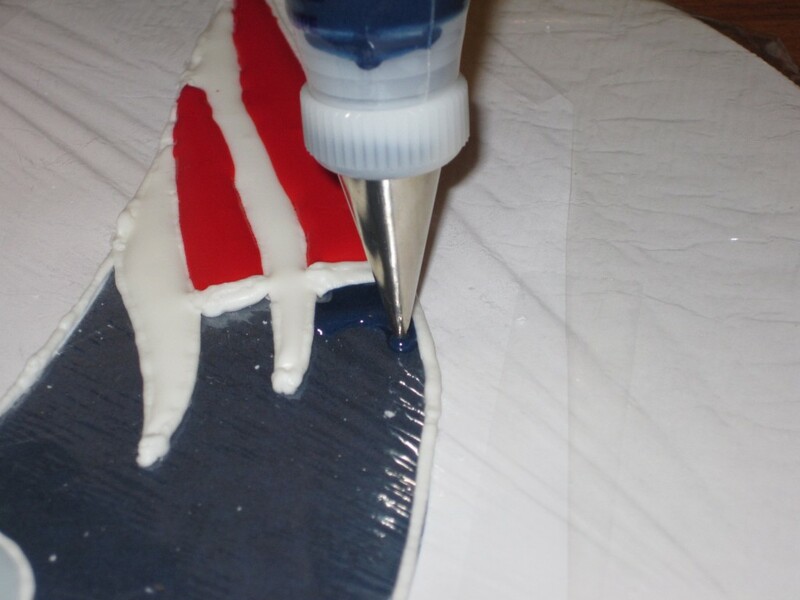 Pour the glaze onto the middle of the top layer and let it flow down the cake sides. Use a metal spatula, if necessary, to completely coat the cake. Use a small needle to puncture any air bubbles. Let the cake sit until the glaze fully sets, about 1 hour. Serve the same day, preferably within a couple of hours. I didn't use the glaze for my cake. Since I was covering my cake with fondant, Michelle at Brown Eyed Baker suggested that I cover my cake with chocolate buttercream instead. 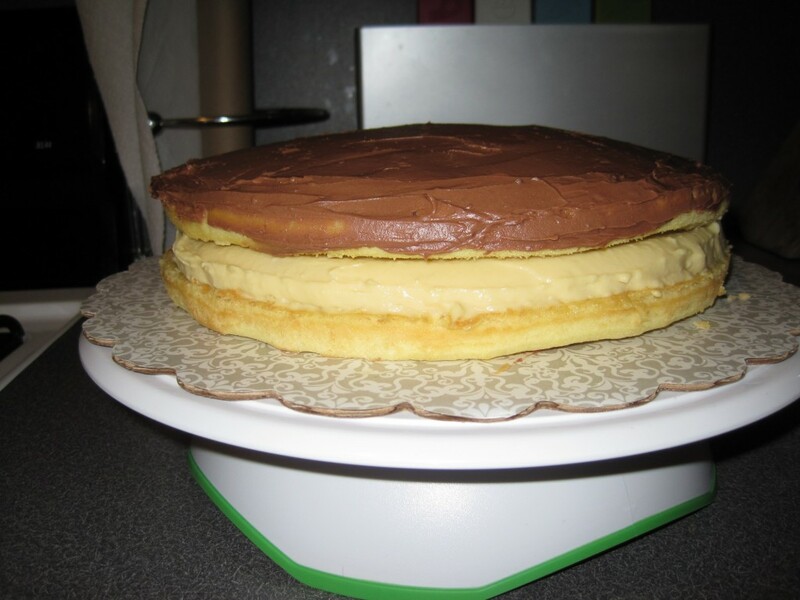 But I added the recipe in case you want to make the traditional Boston Cream Pie. Okay, now for the decorating!! 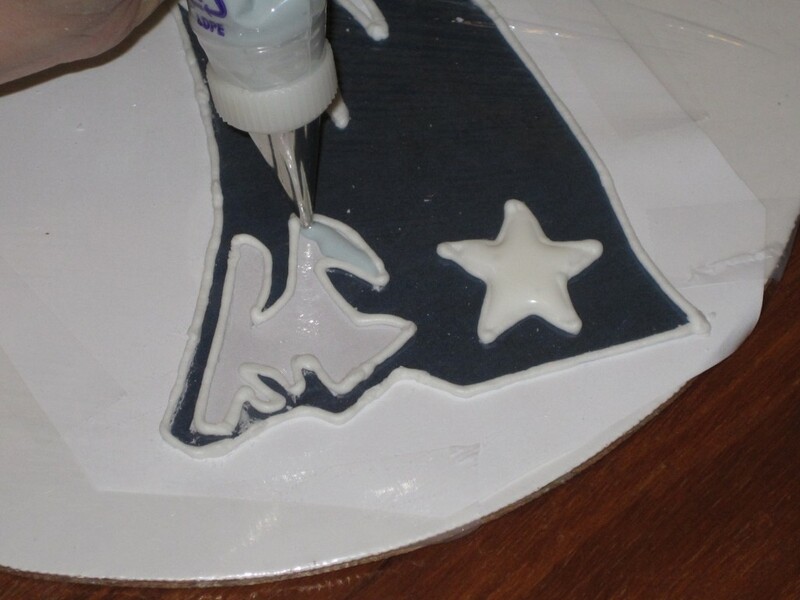 I basically covered the cake with blue marshmallow fondant that I colored to match the Patriots royal blue. Because I’m not perfect with fondant, I covered up any mistakes with white chocolate rounds that I had left over from the bridal cake pops I made a few months ago. I actually like how it looks. 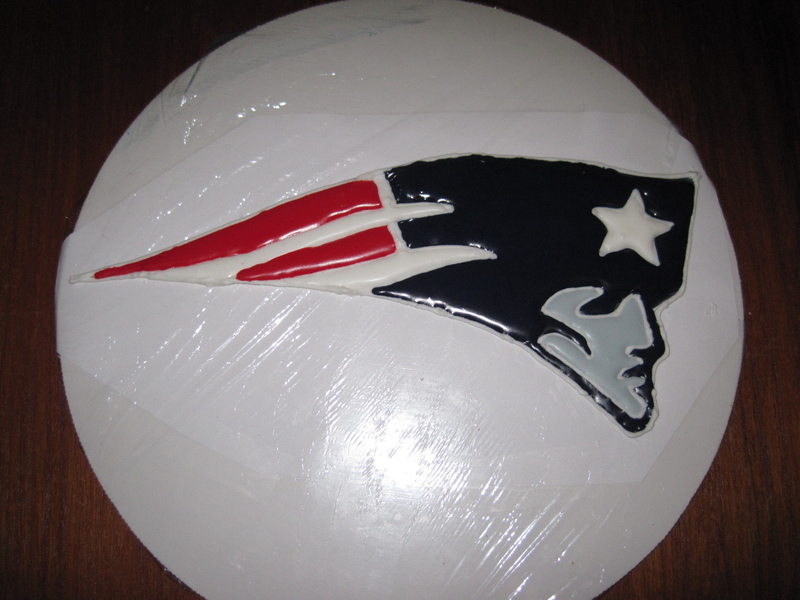 I think it’s a nice accent to the Patriots logo. 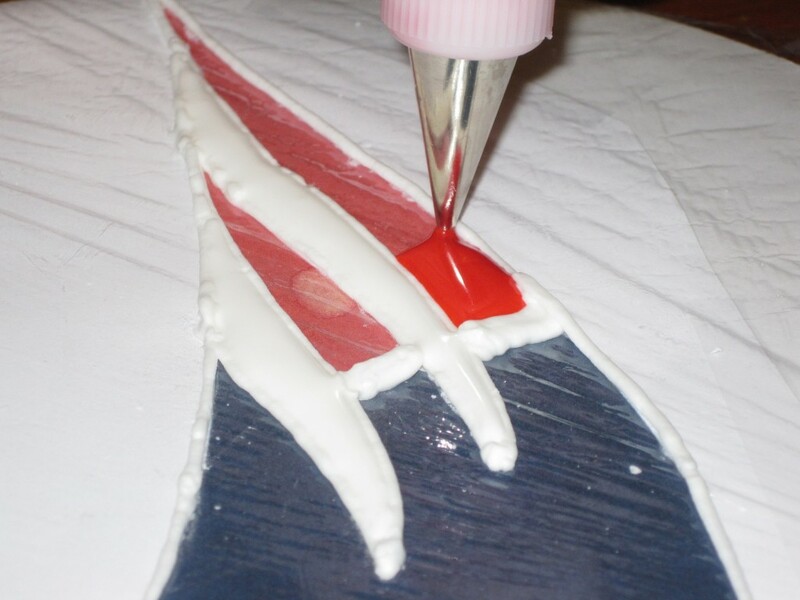 To make the logo, I used a technique called color flow, which I learned in my Wilton cake decorating class. Even though I’m telling you about this part last, it was the first thing I did when making this cake. Color flow takes 2 days to dry, so you need to plan accordingly. 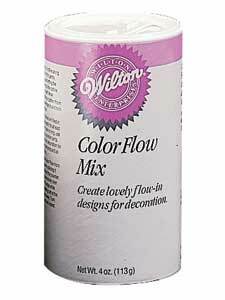 Color flow is a powder made with egg whites, and can be found in most craft stores in the cake decorating section. Mix together in a stand mixer for 7-10 minutes. Keep covered when not in use, because it can easily crust over. Place in a Tupperware container and lay a wet paper towel over the top before putting on the lid. This will keep the color flow from drying out while you work. The first thing you need to do is print out a picture of whatever you want to make. It is easiest if you find one that has the came colors as you want to use. Then you have a template to match your colors. Cut away excess paper, keeping some of the white edge around the picture. 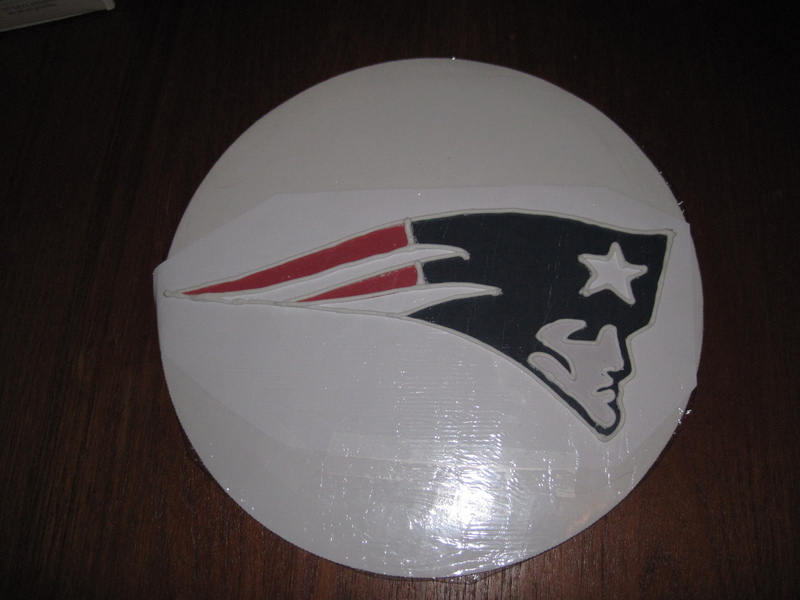 Tape onto a cake round or piece of cardboard. Cover the picture with saran wrap and tape to the back of the cardboard. Make sure the wrap is taut with no wrinkles. 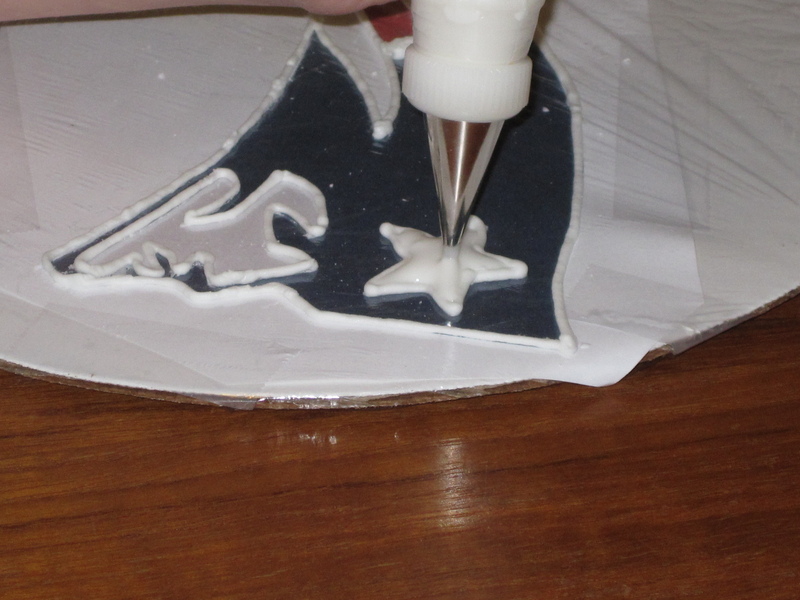 Wilton says to use wax paper instead of saran wrap, but I find that saran wrap is so easy to remove and you can see your picture better to trace. Plus, if you make a mistake in outlining your picture, you can just wipe away and start again. Next, outline your picture with the full strength color flow that you made. Place in a pastry bag and use a small tip. I prefer a #3 tip because it comes out easier and I can get a more even flow than with a #2 tip. Let the outline dry for 2 hours before filling in. Next, take a small portion of the full-strength color flow in a bowl and mix in your color and water. Add a few drops of water at a time. Basically you want it to be a liquid and flow freely. 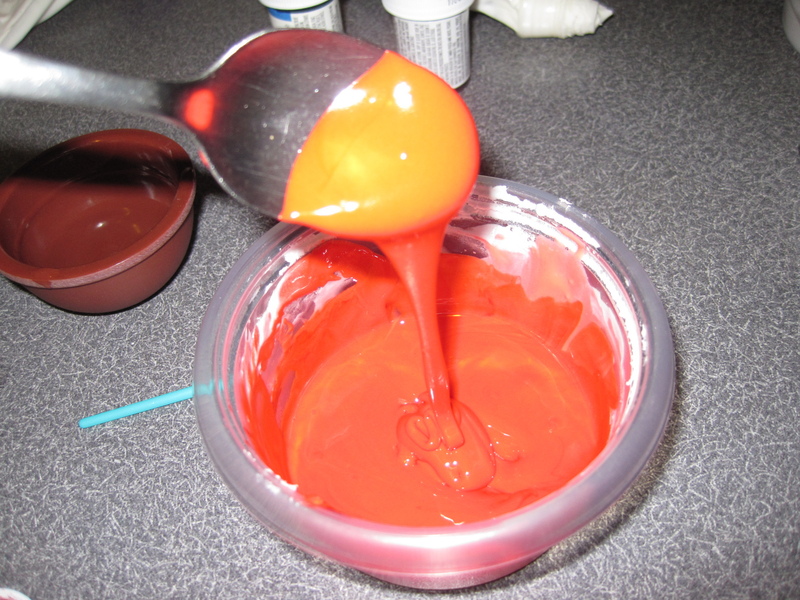 If you take a spoon of your color flow and drip it back in the bowl, the stream should completely disappear by 10 seconds. I make one color at a time and flood the outline until the color flow reaches the sides, leaving no spaces. Then I make the next color and fill in the next area. This gives the color flow time to set in between colors. I like to use a #2 tip for this, so the color flow does not come out too fast. Then I affixed the logo to my cake using royal icing to ensure that it stayed in place and also didn’t break down the fondant on the cake. This entry was posted in Cakes, Logo Work. Bookmark the permalink.